I found myself looking at antiques. In an antique shop. The owner, hidden behind a wall of stacked furniture, was observing me in a large mirror. At first I mistook his reflection for him, and nodded a greeting. When I realised I was addressing a reflection, I peered around the barricade and smirked. He responded with minimal interest. I was a prospective customer, but he could barely acknowledge me. I was interested in the Windsor chair, but it was too late, I couldn’t overcome my embarrassment now, and walked directly out. 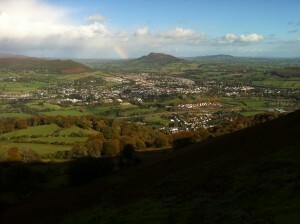 This was Abergavenny, a place I tend to look down upon. I look down upon Abergavenny from the three mountains that surround it. The Sugar Loaf, The Skirrid and The Blorenge. The last of these has an ascent so steep it is almost vertical. You climb on all fours, but standing up. The summit of the Blorenge can also be reached by road, which dilutes the achievement a little, but up there, with lungs screaming for air, this is what you get. 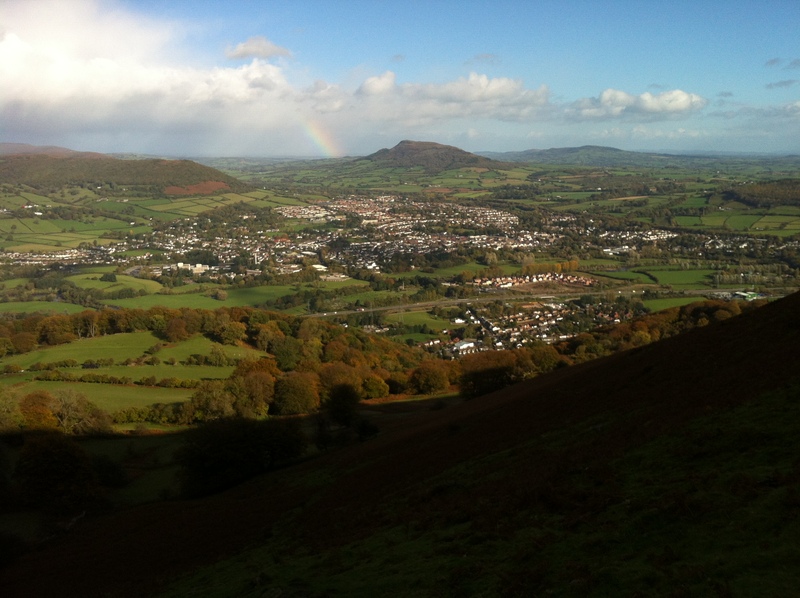 The Skirrid can be seen at the foot of the rainbow, and at the foot of the Skirrid, is The Walnut Tree Inn. I love The Walnut Tree. I fell over on the Skirrid, a long time ago. I thought I had broken a rib. On presenting myself at A&E at the Royal Gwent Newport, and complaining of chest pains, I was immediately rushed into a cubicle and sensors placed on my chest. Only the night before I had been drinking in the Church House, a pub at the Handpost, just outside Newport. The Slowboat Takeaway is just up the road, and above that is a small flat where Green Gartside used to live. I used to see Green wandering the pavements. He was quite famous then, and I never understood why he had chosen to live back in Newport. I don’t think he ever wrote a song about Newport, or the Slowboat. I was drinking alone in the Church House, a pub near the Handpost, just outside Newport, when a bloke slumped down next to me and asked if I could buy him a drink. He was in a bit of a mess, pissed, but seemed good company. I bought him a pint, and he began telling me how hard his life was, how he couldn’t hang on much longer. He told me he was doctor at the Royal Gwent, and although I had no reason to doubt him, I did. He looked bedraggled, and after all, he did ask me to buy him a pint. I’m covered in sensors, wondering why no one will just take my word for it, that this isn’t a heart attack, I’ve just done something to my rib, but the ECG is blipping away and the doctor rushes in, unshaven, squitty eyed, and it’s him, the guy I was drinking with night before. He didn’t recognise me, of course. I was going to tell him about our encounter, but decided not to. The rib took months to heal, and I can’t think of the Skirrid without thinking of that fall. The day of my fall I’d climbed the hill with my parents, neither could manage it now, they are both approaching ninety, and live just around the corner from the Church House. I was there just last week. My mother is very unwell, and my dad cares for her full time. He’s usually very perky, and full of rambling, digressive stories. But last time I saw him he looked weak and frail and was sorry for himself. It was his 87th birthday. “I’ve lived long enough,” he said. I gave him a hug when I left. It was hard. But today I’m in Abergavenny, making my way to the car park after walking out of the antique shop. I get in the car, drive home. On the radio Iain Sinclair is talking about WG Sebald. I love both writers. Sebald’s Austerlitz is one of my favourite books. I prefer it to The Rings of Saturn, which many people consider his masterpiece. Sebald was a walker, and his books are often ramblings in both senses. Sinclair spoke of Sebald devotees who try to retrace his steps and fail. Sebald was a storyteller, Sinclair reminds us. Every Good Friday, when I was a child, friends and I used to walk the ten miles or so to the top of Twm Barlwm, a mountain dominating the reclaimed marshlands of south Wales. In my imagination, uncorrupted by historical detail, this is where the Celts stood fast, watching over the slow encroachment of Romans stationed in the fort of Caerleon, just below. It was a mountain of war, and later, in my teens, I witnessed real battles as gangs from nearby towns fought with chains and axes, as determined as the Celts and the Romans not to give an inch. I watched these events from the safety of the ferns, and sometime later, when the gangs had gone, returned with my dog to wander along the mountain’s spine, to the strange mound at its summit. From there, under the steel grey sky, it felt as if all of the world, and the future, was spread out before me. Arthur Machen’s Hill of Dreams is a book based on his boyhood love of Twm Barlwm, and Machen’s later work, particularly his London Adventure is a hike through the demi-monde of Edwardian London. He was a flaneur who perfected the art of wandering. He wanders London as he wandered the Welsh hills. When, in my early twenties, I followed Machen’s footsteps and moved from south Wales to west London, I worked hard at being a flaneur. I loved strolling aimlessly through the leafy suburbs, and in the city I adored the river’s muddy allure. But I didn’t get to be a seriously good at it, I was Welsh boy in Dr Martens. I didn’t have the style. After my own decade and a half of London adventure, I moved back to Wales, this time away from the industrial south and into the central wilderness. Here I crave nothing more than to be rambling in the mountains, getting closer to the clouds, and sometimes above them. I tend to walk with a small bunch of serious hikers. These people have all the kit, the Nordic poles, heavy duty water bottles, stainless steel thermos flasks. They study maps. Some of them have beards. They are not wanderers, they are athletes. Usually these walks take six hours or so, and often cover twenty miles. We struggle up steep slopes and spill over and down them again. We usually start in a car park and at some point manage to find a pub, often an ancient, hidden place, a few dating back to the thirteenth century, some even earlier. I’ve come upon remote hillside churches with eerie murals, like Death wielding a shovel, or St George slaying what I supposed was a dragon but which looked more like a giant, angry sparrow. I know the twisted spine of Cwmyoy, and the tumbling, secluded magic of Llanthony and Tintern. Most of my fellow hikers have travelled this way before, and they know the stories. Up high in the mountains I’ve seen the wreck of a Wellington bomber that lost its way in the fog; the caves where the Chartists hid their weapons as they planned revolution. There’s the poet’s chair, and the grave of a famous racehorse. There are standing stones, remnants of Iron Age forts, terraced ramparts, a hermit’s cell. I’ve looked across the plains of Herefordshire and seen the blue remembered hills of Shropshire. Look south and there’s the Severn, glinting. I like writers who are walkers: Rosseau, Wordsworth, Machen, Bruce Chatwin, WG Sebald. Wandering has a great pedigree. In their books one phrase reappears time after time: solvitur ambulando – you can solve it by walking. After hiking all day whatever problems you have disappear, and the simple pleasures of sandwiches, or a flask of tea, with the land spinning about you, miles and miles of it, on and on, never ending, whisk all worldly cares up into the clouds, to be lost forever in the vast ancient wilderness. n.b. this originally appeared in the Awfully Big Adventure Blog.